Running the Iditarod... In this story, you will read about one special racer who struggles to overcome the odds and to make the most of her last chance at an Iditarod victory. Click on the book cover to hear a read-aloud of Akiak. 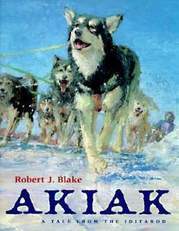 Click on the document to read Akiak: A Tale from the Iditarod. In 1925, children in a remote Alaskan city were being struck down by a deadly disease. The cure was hundreds of miles away, across a frozen wilderness. There was only one hope...dogs. Learn more about Alaska, the Inuit, and the famous Iditarod race! Click here to go to the Iditarod...the last great race! 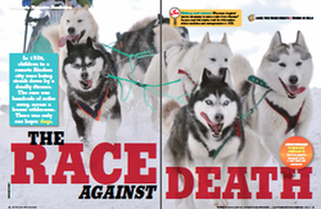 Click here to go to the Scholastic News website to learn more about Alaska and the Iditarod. Mush rush! Discover the great sport of dog sled racing. Navigate your team through the obstacles to complete a race! Click on the dog sled team to get started! Explore these websites that will help you compare details in the article "The Race Against Death" with life today.